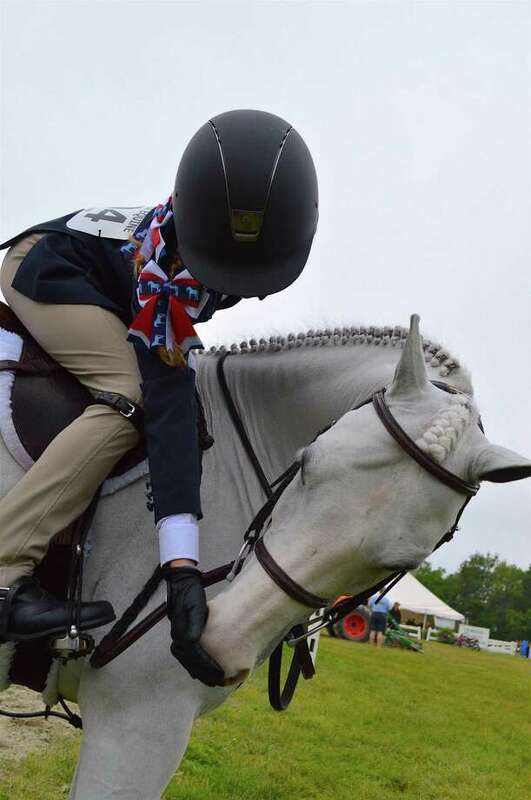 Community Buzz: Scholarship winner, YWL awards $120k in grants..
Charlotte Jumper, 10, of Westport, shares an Oreo cookie with her horse Top Hat at the Ox Ridge Hunt Club's June Horse Show, Saturday, June 17, 2017, in Darien, Conn.
, who just graduated from New Canaan High School, was the winner of this year’s PEO STAR Scholarship award presented by the New Canaan chapter, PEO Chapter N.
The scholarship was established in 2009 to provide funds for exceptional high school senior women to attend an accredited postsecondary educational institution in the United States or Canada in the next academic year. A woman is eligible to be recommended for the PEO STAR Scholarship provided she exhibits excellence in leadership, academics, extracurricular activities, community service and potential for future success. New Canaan’s John Fiorito, who is majoring in finance, made the dean’s list at The College of New Jersey in Ewing for the spring semester. To achieve this honor, a student must carry 12 or more credits that semester and earn a 3.5 (or above) grade-point average. The University of Wisconsin-Madison has recognized students named to the dean’s list for the spring semester, including three New Canaan natives. To be eligible for the dean’s list, students must complete a minimum of 12 graded degree credits in that semester. In the School of Human Ecology, Haley Anderson was named to the dean’s high honors list. In the College of Letters and Science, Isabel Marshall and Thomas Williams, made the dean’s list. Three New Canaan natives have been selected for inclusion on the dean’s list for academic achievement during the spring semester at St. Lawrence University in Canton, N.Y. To be eligible for the dean’s list, a student must have completed at least four courses and have an academic average of 3.6 based on a 4.0 scale for the semester. Allison I. Christopher, a member of the class of 2017, is majoring in economics and business in the liberal arts. Christopher attended St. Luke’s School. Catherine I. Christopher, a member of the class of 2017, is majoring in economics and business in the liberal arts. Christopher attended St. Luke’s School. Tyler C. Sands, a member of the class of 2017, is majoring in performance and communication arts and business in the liberal arts. Sands attended New Canaan High School. Cameron Devitt was named to the dean’s list at Miami University in Oxford, Ohio for the spring semester. Miami University students who are ranked in the top 20 percent of undergraduate students within their division have been named to the dean’s list recognizing academic performance. Devitt, from New Canaan, is earning a Bachelor of Science in business, majoring in accountancy. University of Alabama student Caitlin Connor Jones, of New Canaan, was named to the president’s list for spring 2017 due to her 4.0 academic record (all As). Two New Canaan natives were named to the dean’s list at Colby College in Waterville, Maine, for outstanding academic achievement during the spring semester. Students earned a semester grade point average of 3.77 or higher this spring to be included. Michael B. DiCosmo, a member of the class of 2018, attended New Canaan High School and is the son of Mary DiCosmo and Bruno DiCosmo of New Canaan. He majored in biology with a concentration in cell and molecular biology and biochemistry. Eloise M. Somerby, a member of the class of 2019, attended St. Luke’s School and is the daughter of Craig and Elizabeth Somerby of New Canaan. She majored in economics. New Canaan’s Julia Hardy and David Means were named to the dean’s list at the College of William & Mary in Williamsburg, Va. for the spring semester. In order to achieve dean’s list status, a full-time degree-seeking undergraduate student must take at least 12 credit hours and earn a 3.6 quality-point average during the semester. Six New Canaan natives were named to the dean’s list at Quinnipiac University in Hamden for the spring semester: Thomas Barber, Nicole Curto, Francis Duane, Brandon Friedman, Kyle Levasseur and Barbara Pincione. To qualify for the dean’s list, students must earn a GPA of at least 3.5 with no grade lower than C.
The Young Women’s League of New Canaan held their closing soiree at Waveny House on June 14, celebrating a record-breaking year. Over $120,000 was donated to 22 local children’s charities. Among other things, this funding provided two new trauma rooms for the Human Resources Council’s Children’s Connection, sponsored three children through Project Morry’s mentoring and summer program, and supported the YMCA’s Special Needs Program. Charities who wish to be considered for a grant should visit ywlnewcanaan.org/Apply-For-A-Grant to download an application. All applications are due Aug. 1. New fundraising events are already in the works, including “Fall Into New Canaan: Celebrate the Season in our Village,” a partnership with the Chamber of Commerce and the Town of New Canaan on Sept. 9, which will include the first-ever scarecrow-decorating competition and evening social event in the Pop-Up Park. The YWL is a service-based, social organization enriching Fairfield County through fundraising and volunteering efforts. Furman University in Greenville, S.C. awarded James Brannan, of New Canaan, a Bachelor of Arts during graduation exercises May 6. Jaclyn McCurdy, of New Canaan, was among more than 3,000 students from Miami University in Oxford, Ohio who received degrees during spring commencement exercises May 13. McCurdy received a Bachelor of Arts, majoring in strategic communication. Four New Canaan natives graduated from Fairfield University May 21. Anna C. Borea received a Bachelor of Arts in politics from the College of Arts and Sciences; Robert C. DeWaele received a Bachelor of Science in finance from the Dolan School of Business; Alexandra M. Tubridy received a Bachelor of Science in mathematics from the, College of Arts and Sciences; and Robert J. Valente received a Bachelor of Science in finance from the Dolan School of Business.